Winter Food Drive for Homeless CMS Students | New Growth Hair Magazine | We capture the culture of urban barbershops and beauty salons. We are seeking your support to provide food to hungry CMS children. Canned Goods (pop tops preferred), Cereal (low sugar preferred), Peanut Butter & Jelly, Oatmeal, Rice, and Pasta & Sauces. Note: We will deliver food items to the children on 12/12/15. You are welcome to come to the school on 12/12 but you aren’t required. 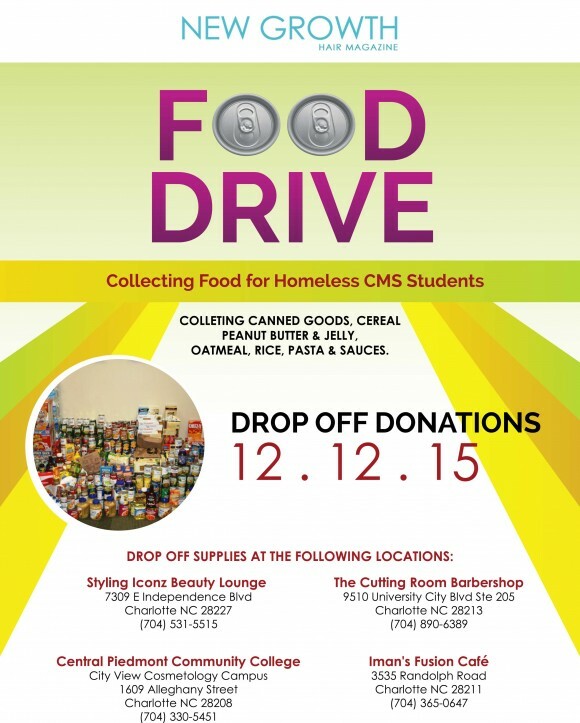 If you are unable to attend on 12/12, please drop off items at our Drop Off locations.